Amy is the newest Director of Business Development at Akademos, responsible for building new partnerships in the Western US. She has worked in Higher Ed for over 20 years, specializing in Retention, Data Analytics, Financial Aid and Enrollment. Amy is passionate about bringing new ideas to the industry to foster a successful student lifecycle. The student of today looks much different than 10, or even 5, years ago, which is why it can be extremely difficult to diagnose what may be at the heart of declining enrollments and higher attrition rates. According to the National Student Clearinghouse Research Center, 30 percent of students who entered college in the fall of 2014 did not return for year 2.1 The 6-year graduation rate in the U.S. is reported at 59%2, however, some believe this to be even lower due to the method upon which colleges are reporting these rates, and if transfers are included as part of the calculation. For many schools, the cost to retain a student is more cost-effective than recruiting a new one, and this shift will continue as we see a trend in educational sectors closing schools, merging or moving to predominantly online models. Why is higher education in America struggling and how can we address some of the reasons students are not persisting and graduating? After spending the last 5 years with an organization that utilized predictive analytics and software to determine risk and student success, it has become apparent that while there are many factors that truly make an impact, there are concrete options for institutional improvements. One common theme that was consistent in feedback from many schools was the importance of textbook affordability and access to low-cost resources, including Open Educational Resources (OER) and Inclusive Access (IA). Improving retention and academic outcomes can start with a simple step - help more students purchase or have access to all of their required materials by the first day of class. 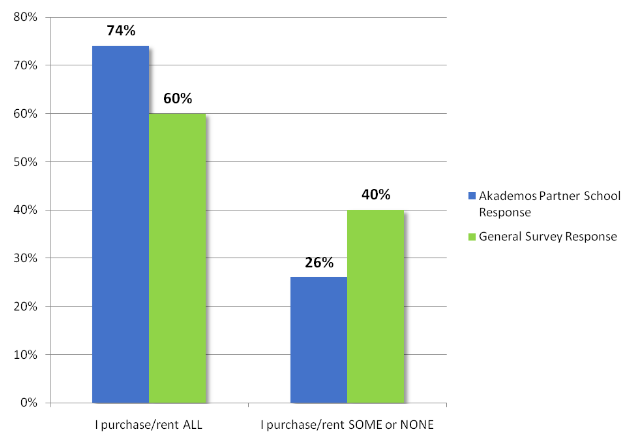 As noted in our recent college student survey, many students forego purchasing required course materials primarily because they’re too expensive. Yet unsurprisingly, the great majority of students that have taken classes without materials say they would have performed better if they had purchased them. Our data indicates that an online bookstore solution drives more students to purchase ALL of their course materials (74% versus 60% for non-Akademos partner schools). In addition, our software platform provides analytics and insight into which students have purchased their academic materials and, in concert with other data, allows faculty and administrators a more holistic picture relative to at-risk students. As more schools are being forced to compete for performance-based funding in the face of declining completion rates and growing barriers to success, complicated strategies such as Success Coaches and intrusive advising policies are emerging. However, there are simple strategies that can be deployed that will make a difference. As higher education has evolved from an “Institutional-centric model” to a “Student-centric model” it’s clear that retention and student success isn’t just one department’s role on campus; it’s everyone’s role. The importance of a holistic approach and the evolution to meet students where they’re at is one of the first places an institution can start. Equipping students with the right resources and course materials on day one is pivotal in setting them up for success. I believe in the mission to deliver affordable educational materials to all students and this is one of the main reasons I was excited to join the Akademos team. I look forward to working with colleges and universities to better understand their challenges by providing affordable course materials and implementing solutions to help increase student success.